My guestroom makeover is underway, and I've got the mess to prove it. Luckily, there are no guests in our immediate future, because they'd be tripping over junk and finding drill bits in their beds. I'd like this room to have a light, airy, feminine, French vibe. If you missed them, you can check out my inspiration photos here. Today I thought I'd show you some of the elements I'm incorporating in the room. This French Provincial armoire was given to me by my Nana when she downsized from a house to an apartment. I debated about painting it, but decided to try to work with it the way it is. She also gave me a headboard that sort of matches the armoire. I purchased new bedding at Cible (that's a fancy French word for Target... at least I hope it is. I studied Spanish. I don't know the Spanish word for Target.) Anyway, I'm trying to keep up the French vibe, so work with me here, people. My fine french linens are Simply Shabby Chic. Yes, mom, I do plan to iron the wrinkles out and cut the tags off. I would LOVE to find a small vintage aubusson pillow for each of the beds. I've been stalking etsy and ebay, but no luck yet. One of the first changes I made to the room was replacing an ugly brass flush mount fixture with this tole chandelier that I bought on ebay ages ago. It hangs in the little alcove/entry of the room. I'm still looking for another chandelier to replace the large ceiling fan over the beds. I added a drapery panel to the one and only window. It's a natural raw silk drapery from Soft Surroundings. I love the texture it provides and the way it allows the light to shine through. This mirror was another Springfield flea market purchase. I love the intricate detailing of it. But, my favorite addition to the room thus far is this clock. 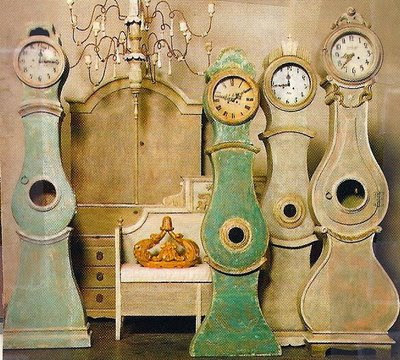 I have been coveting mora clocks for some time. Okay, so it was probably made in China last month instead of Sweden in the 1700s, but I love it. And my kids can still go to college. Did you like the white ethereal glow around my pictures? Makes everything look pretty dreamy, doesn't it? A little prettier than the reality, huh? I love the little teaser photos and can see this is going to be one scrumptious guest room!! Can't wait to see more! You are well on your way to a gorgeous guest room! Looking forward to the final reveal! BTW, I love Soft Surroundings! You have the anchor pieces and they are beautiful and also have history of you family. You are putting it all together so nicely. Looking forward to seeing the final outcome. Love the way you are including family pieces. Adds such character. Hope you have a great weekend! The armoire and the headboards are GORGEOUS!!! What a great start to your room, but the mora clock! It's fabulous! I want one, too. You must tell us where you found it. Your bedding is perfection! Your guest room is going to be so lovely and relaxing, people won't want to leave. These are some great pieces! I can't wait to see the big reveal! Love it Carolyn! That clock is beautiful no matter where it's from! That little chandelier is just beautiful.